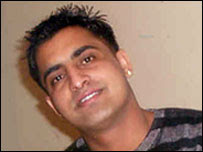 Sikh Lad Stabbed to Death! A teenager has been charged with the murder of a man who was stabbed at a bus stop in east London. Jaspreet Singh was attacked as he and a friend waited for a night bus in Chapel Road, Ilford, early on Saturday. The 25-year-old was taken to King George Hospital, Goodmayes, but died from a single stab wound to the heart. Kamuzu Munroe, 19, of Ilford, is due to appear before Redbridge Magistrates' Court on Monday charged with murder. Police have appealed for witnesses. According to police, the two friends had got off the number 123 bus outside Greggs bakery in Ilford town centre, before walking to Chapel Road to wait for the number 369 night bus. An argument then broke out at about 0100 BST and Mr Singh was stabbed, police said. Earlier, Det Ch Insp John MacDonald said they had now spoken to the victim's friend but still wanted to hear from any other witnesses. "We believe that there were people at the bus stop who witnessed the altercation who then got on the 369 bus. We need these people to come forward."